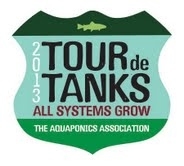 The Aquaponics Association along with hobby, community and commercial aquaponics enthusiasts around the US are opening their doors during Earth Week to show people the exciting and innovative way that we love growing food. By combining fish and plants together we get more to eat, an excellent protein source, highly nutritious, chemical free foods, that produce zero waste and conserve natural resources. Come check out our home and community-scale aquaponics systems, growing food for our families, local restaurants, markets and providing some nutritious food options for a neighborhood considered a food desert.